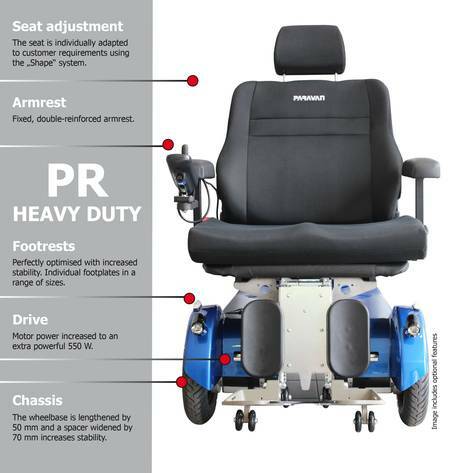 The strongest member in our range of power wheelchair solutions is the PR Heavy Duty. This power wheelchair model has been specially developed with the obese in mind. People weighing up to 270 kg have no problems getting about with the PR Heavy Duty. The chassis has been made wider, the wheel base lengthened, and the construction strengthened. Seats measuring up to 70 cm in width can now be fitted on the chassis. According to the latest studies, patients are getting heavier and heavier. We are catering for this development with the new Paravan PR Heavy Duty. In addition, there are not many manufacturers in the world who build wheelchairs for the obese. When developing this model, it was important to design a mode of transport that did not exceed the standard dimensions of daily life. 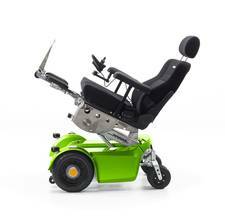 In addition to this extensive range of standard colours for your Paravan power wheelchair, we would also be delighted to customise it to your requirements. Special shades and paintwork, airbrushing or the application of your own decals – our creative team ensures that your wheelchair will be just how you want it.